In all three of the new videos in the campaign, Samsung shows customers asking questions about the iPhone X and the Galaxy S9 at a mock-up Apple Store. The "Ingenious" campaign name plays on the in-store Genius employees, with the actors in those roles giving what could be considered sub-genius responses. The "Dongle" ad spot attempts to make fun of the iPhone's use of a headphone adapter to enable users to listen to music with wired headphones. The actor playing the customer asks what to do if they need to charge the iPhone at the same time, with an Apple Store employee suggesting the use of another dongle. "Fast Charger" notes the iPhone X does not ship with a fast charger in the box, while Samsung's Galaxy S9 does. The store employee flatly advises the customer could buy a "fast charging adapter" and the USB-C to Lightning cable separately, with the advice of buying more accessories serving as the punchline for the clip. Lastly, "Camera" mentions how the Galaxy S9 has a higher DxOMark score than the iPhone X, achieving 99 to the iPhone X's 97 mark. The three new spots continue the "Ingenious" ad campaign that commenced on Tuesday. The first video, "Speed," makes the claim that the Galaxy S9 is capable of faster download speeds than the iPhone X. The latest campaign is certainly not the first time Samsung has taken aim at its main rival in the smartphone market. 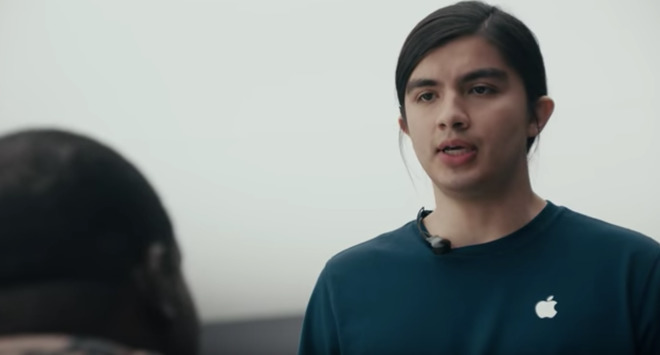 Another ad released in May depicted a user becoming frustrated at the speed of her iPhone 6, poking fun at advice from an Apple Store employee suggesting to disable "performance management" features or to buy a new iPhone.